July brings us a new awakening, just as each month brings us a new moon and new opportunities. As we move past the very center of 2018, July reminds us that all things have a beginning and an end. While June brought us the longest day of the year, July makes us reflect inward on what that climb meant to our personal journeys, and leaves us to think on what might be coming next for us. Because of this, it should come as no surprise that a popular spiritual theme for July is consciousness. We tend to think of the summer months as a time of freedom, so don’t be afraid to let your mind run free. Let yourself freely explore what it means to just simply be. Do not hold back any urges to be spontaneous as you might learn something new about yourself in the process. Reflect and recharge during this month to truly reconnect with your inner dialogue. This will bring you closer to consciousness. It might be difficult to think of July as the tipping point towards the later half of the year, but it’s true. There are many ways that one can prepare the mind, body, and soul for the more mentally difficult winter months, and that work must start at the tipping point. Now that we’re coming down from the summer solstice, it’s important to be in tune with your experiences and understand what your innermost feelings. But what does it actually mean to be truly conscious? According to scholars, consciousness, simply, “is everything you experience.” Without being able to access one’s consciousness, there is an inability to feel and react and experience. Embrace the changing weather around you. Take a long walk by yourself in the summer sun. Be alone with your thoughts. These are some of the ways that you can focus on committing yourself to consciousness. Once you are locked into your inner dialogue and the thoughts that fuel you, you will be able to lead a more confident, fulfilling, and enjoyable life. Without feeling the experiences of life, we lose the ability to be empathetic towards others and connect. Take the time that we have remaining in July to stand committed to your consciousness and you will lead a happier August, which will lead to a more compassionate September, and a stronger October. Meditation is an excellent way to try and repair any broken lapses in consciousness. There have been many who have tried to gain a higher state of consciousness through the art of meditation. An interesting study regarding the practice of meditation shows how reflection can bring you into a truer state of being. To be true to yourself you must be true to your feelings and experiences. 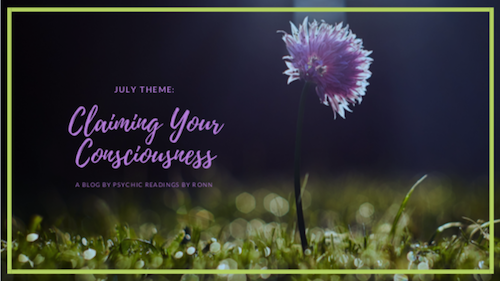 If you feel that you are drifting from your consciousness, July is a wonderful time to reconnect and mentally prepare for the journey that lies ahead.